I received free samples of Swerve mentioned in this post. By posting this recipe I am entering a recipe contest sponsered by Swerve and am eligible to win prizes associated with the contest. I was not compensated for my time. Are you celebrating National Nutrition Month and looking to go further with your food and health? Or are you anxiously awaiting the arrival of Girl Scout cookie order forms to purchase your favorite cookies? Maybe you’re observing the season of Lent and went down to New Orleans for a Mardi Gras celebration? While these may seem like completely unrelated questions and themes, they actually come together in a sweet symphony for my latest recipe- Chocolate Peanut Butter Thumbprint Cookies. 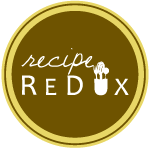 This March I am participating in a Recipe Redux Contest featuring Swerve Sweetener- a natural, preservative-free, and non-GMO sweetener product that hails from New Orleans, Louisiana. And since my husband and I always over order on Girl Scout cookies during the spring selling season, I figured I’d take this opportunity to create my own version of our favorite cookie- the Tagalong or Peanut Butter Patty- with a healthy twist for National Nutrition Month. I discuss sweeteners with my patients often, but have never been a fan of the colorful packets myself, preferring to use a small amount of the real stuff and avoid the unpleasant aftertaste. Yet, when people I work with are working to manage their diabetes and weight in a more healthy, but still enjoyable way, I would like to put my money where my mouth is so to speak. This is why I love Swerve- it contains zero calories, does not affects blood sugar, and has quite a pleasant taste! Artificial sugars can be scary to consumers for many reasons, but at the end of the day the most common concerns I hear are about what’s really in the product and what are the side effects to my health? Swerve answers these questions clearly; all of the ingredients for Swerve can be found naturally in select fruits and starchy root vegetables, and are sourced in North America and Europe from non-GMO crops. In terms of side effects, Swerve has another leg up on the competition here. Since it’s main ingredients is erythritol- a common sugar alcohol- Swerve has a high GI tolerance and does not cause tummy troubles like other sugars that end in “ol” and often send people running to the bathroom. As I mentioned, I wasn’t one to use artificial sugars much- not in my coffee and certainly not in my baked goods- so this baking project was going to be a new challenge for me. Luckily, Swerve measures cup-for-cup like regular table sugar, and so it was with only the normal amount of baking trepidation that I set out to recreate a low-sugar version of a beloved cookie. Sugar-free baking fears be gone- this recipe turned out to be a winner! The shortbread has a nice crumbly consistency, which I would expect from using the Swerve granulated sugar, and the peanut butter filling was just the right amount of smooth sweetness thanks to the confectioners sugar. To add to the healthy factor, I used whole wheat flour, and only a drizzle of dark chocolate instead of a dunking. I can see many more uses for Swerve in my future and encourage you to satisfy your sweet tooth with Swerve Sweetner! Prepare the cookie base. Using electric beaters, cream the butter and sugar in a glass mixing bowl until light and fluffy. In a separate bowl, sift together the flour and salt. In 2-3 increments, stir the dry ingredients into the butter mixture, scraping down the sides of the bowl occasionally. Add the milk and vanilla; stir only until incorporated. Wrap the dough in plastic wrap (separate it into two balls of dough if it is easier to handle that way) and refrigerate for 2-3 hours, until it is very firm. Preheat the oven to 350°F. Line two baking sheets with parchment paper. Pinch off pieces of dough, and roll into approximately 1-inch circles. Lightly flatten each ball with your hand, trying to ensure that the edges don’t crack too much- I was very challenged by this, so my advice is to press gently. Place the rounds of dough on the prepared cookie sheets, leaving about an inch between (they will spread a little, but not too much). Bake for 12-15 minutes, or until they have a dull finish on top and are just golden on the edges. They will not look fully cooked, but they will continue to harden into the perfect shortbread while cooling. Remove from oven and let cool for about 5 minutes on the sheet. As soon as they are not too hot, using a thumb or the back of a small spoon, make an indent in each cookie (they should still be fairly soft, so it should be easy to indent them without breaking them). Leave them right where they are for the moment. In a medium saucepan, melt the nut butter on low heat until it is a thick, easily stirred liquid. Add the Swerve confectioners sugar and stir until incorporated. Add the vanilla last, stirring in until incorporated. Remove from heat. Let it sit for about 10 minutes; the mixture will start to thicken a bit. Place a teaspoon (a little more or less, upon your taste) of the nut butter mixture in the indent on each cookie. Melt the chocolate by using the double boiler method (if you have one) or by melting directly in a saucepan on a low heat, stirring constantly to avoid burning the chocolate. Rather than dipping the cookie completely in chocolate as traditional Tagalongs are, use a spoon to drizzle the melted chocolate over the top surface in a zebra-stripe fashion. Place the chocolate coated cookies on a sheet of waxed paper, nonstick silicone, or even aluminum foil, and let set for 2-3 hours before enjoying. Want to see more recipes using Swerve? Find them at the Recipe Redux page below!